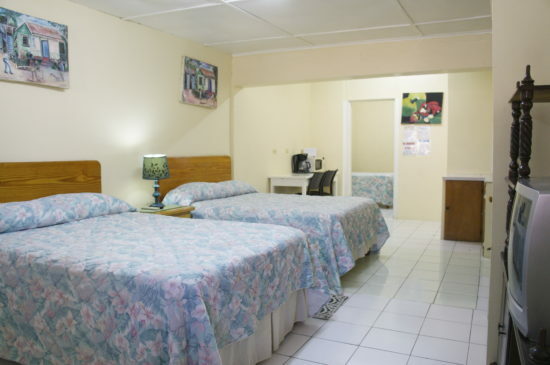 The Irie Inn Hotel | The Irie Inn Hotel, inexpensive hotel rooms located in the heart of Montego Bay, Jamaica's Hip Strip. 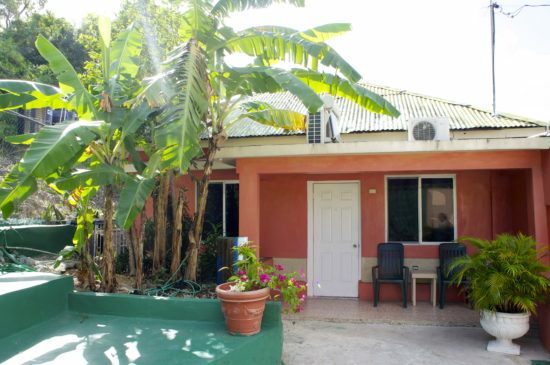 Walking distance from the beach, clubs, restaurants and shopping. 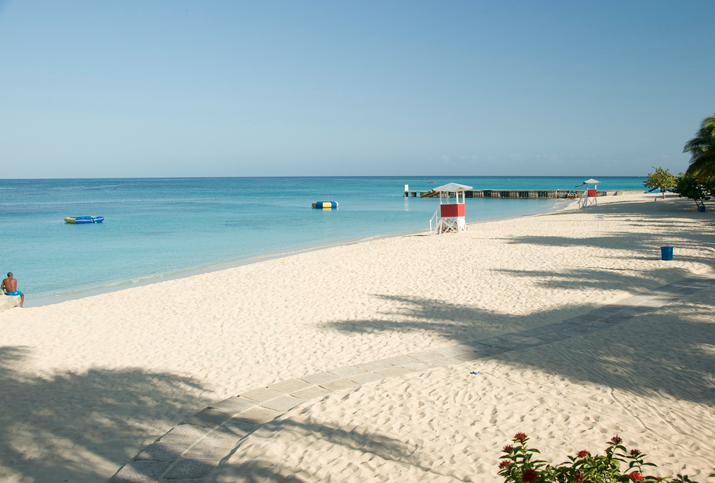 Come to Montego Bay and Feel Irie! Doctors Cave Beach World Famous Beach only 5 min walk! Margaritaville Daytime fun - Nighttime club ! 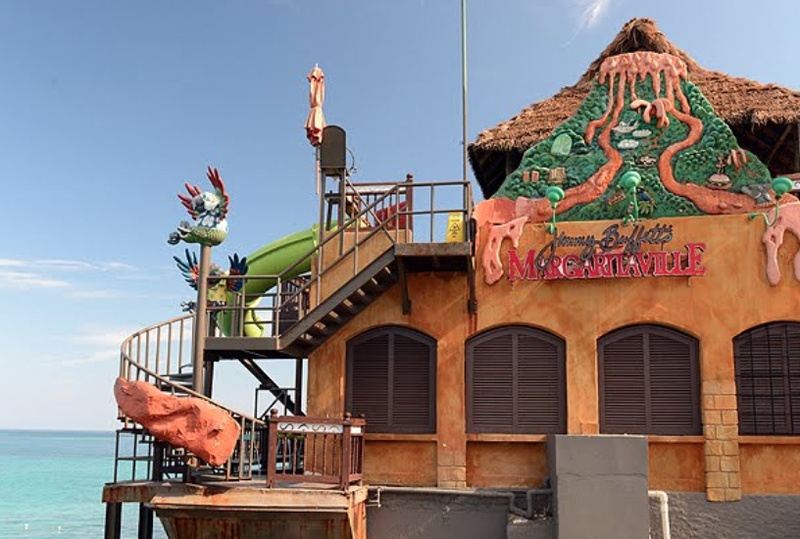 Just 2 min walk away Margaritaville has a 120 foot water slide that drops you in the Caribbean Sea! The club is jumping on Thursday and Saturday. 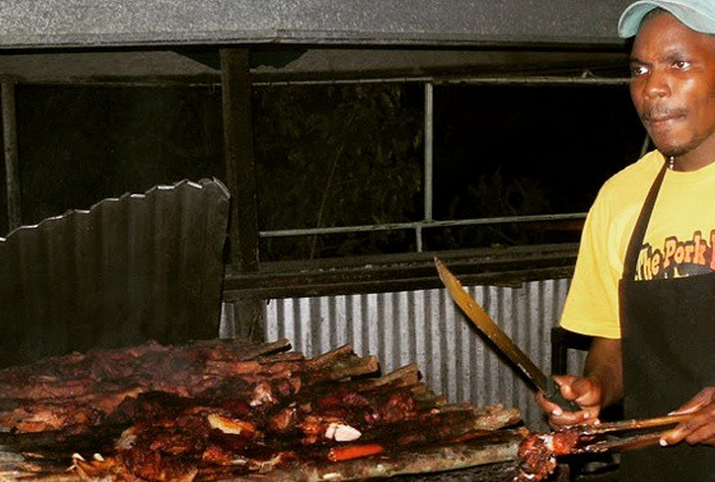 The Pork Pit has been famous for its pimento smoked jerk chicken and pork. Although it is a la cart it is one of the best on the island! Welcome to the Irie Inn! A truly incredible value in the best location possible for those who want to be in Montego Bay’s premier tourist area “The Hip Strip”. We are stumbling distance from Jimmy Buffett’s Margaritaville, a walk across the road from the beach, and we sell discount tours on site such as Dunn’s River Falls, swimming with the dolphins, Bob Marley Museum, and more. 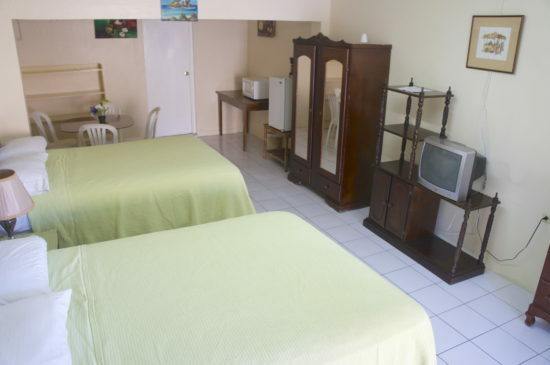 Not to mention, the 5 rooms that we have available are bigger than your usual hotel room and come with air conditioning, cable TV, refrigerator, microwave, coffee maker and free wireless internet connection. We do not recommend light sleepers stay with us, as parties are happening all around the Irie Inn! Restaurants nearby include Marguerites by the Sea, Pelican, Pork Pit and more. There are plenty of shops for souvenirs right down the street.The most famous beach in Jamaica, Doctors Cave, is walking distance from The Irie Inn, offering crystal-clear turquoise waters and near-white sand. 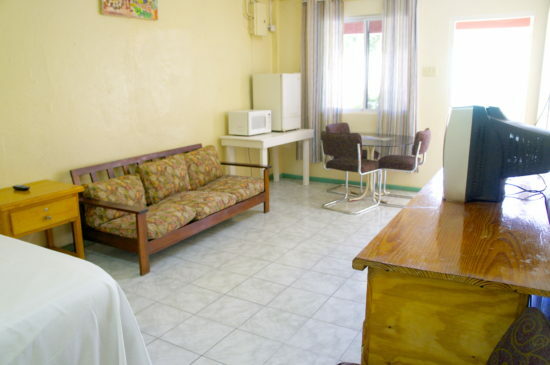 These spacious apartments can accommodate up to Four Adults and Two Children. Happy Booking! The irie inn was such a great place to stay. The staff were really friendly and helpfull, they made us feel safe all the time. Pauline is awesome, if you have any queations about montego bay she will know! The rooms are big, the beach is right across the streets. 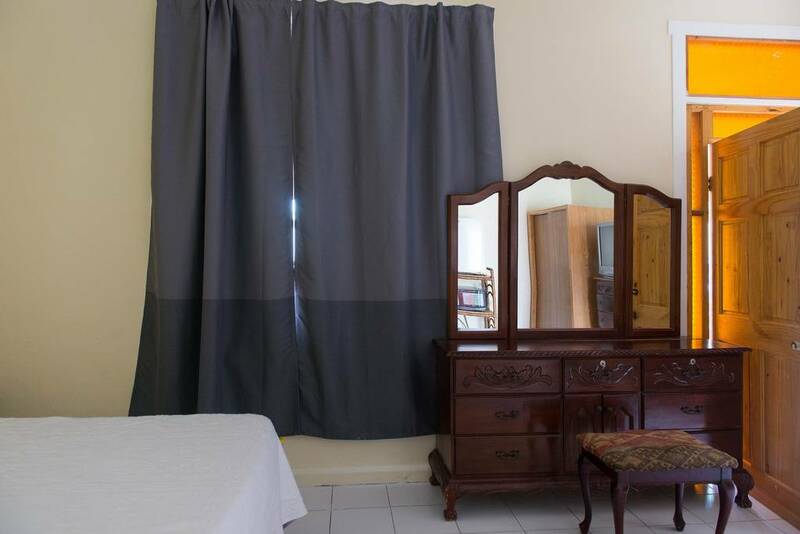 Walking distance to clubs and local restaurants. We stayed there for a week and we loved it! You can’t beat the location of The Irie Inn. It’s across the street from a lovely public beach. It’s a 5 minute stroll from The Pork Pit, a phenomenal establishment offering jerk pork (I highly recommend), jerk chicken, shrimp, rice and peas, festival, etc. It’s also a 5 minute walk from many shops and an 8 minute walk from Doctor’s Cave, a private beach that one can enter for $6USD. Pauline was kind enough to let my friend and I Ieave our luggage as we arrived a little before check-in. The room was clean, with fridge and microwave. Bathroom nice as well. There are chairs on the front stoop to sit out and relax, enjoy the pleasant sea breezes. 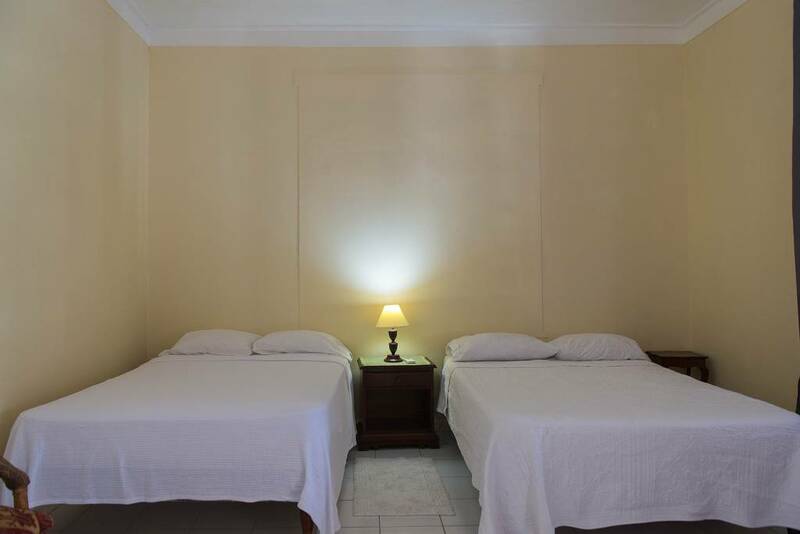 Room 1 is a spacious 300 sq foot room with high ceilings. The bathroom was completely upgraded at the end of 2016. It comes with a microwave, coffee maker and small fridge. A hot plate is available upon request. 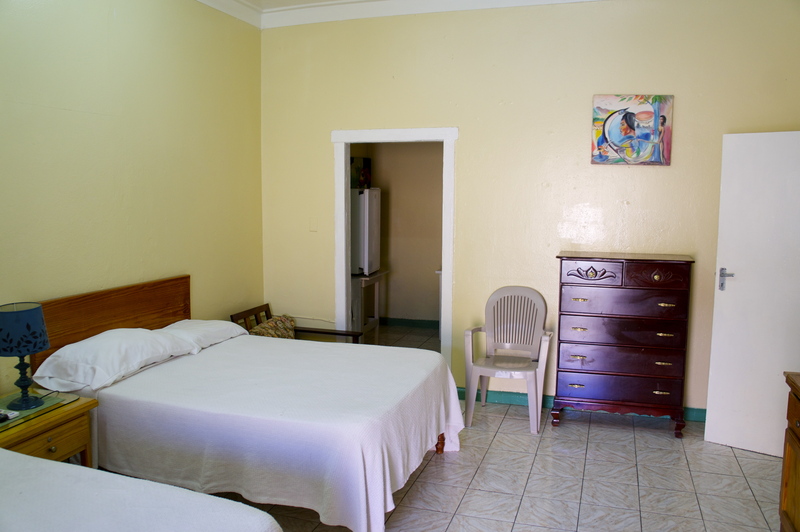 Room 2 is a spacious 353 sq foot room with high ceilings. It can open up to an additional second bedroom when required. It comes with a microwave, coffee maker and small fridge. A hot plate is available upon request. 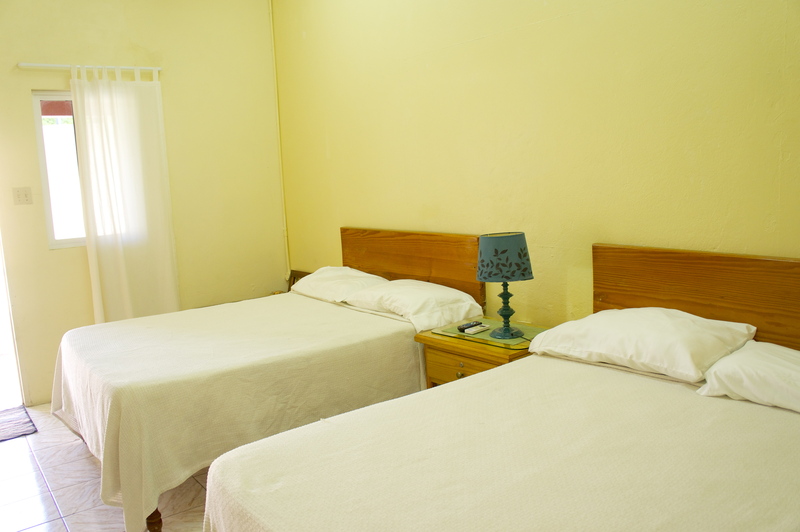 IF BOOKING FOR 1 – 3 PERSONS, 2ND BEDROOM WILL BE CLOSED OFF UNLESS YOU CONFIRM RESERVATION FOR 4 OR MORE AND PAY THE EXTRA. IF BOOKING FOR 4 OR MORE PERSONS, 2ND BEDROOM WILL BE OPENED UP. FREE PARKING AVAILABLE ON PROPERTY. The room has its own private entrance that opens up to a patio. Just across the street there is a free public beach and park! Room 3 is a spacious 312 sq foot room. If booking for more than 3 people an additional bedroom will be opened. It comes with a microwave, coffee maker and small fridge. A hot plate is available upon request. IF BOOKING FOR 1 OR 2 PERSONS, 2ND BEDROOM WILL BE CLOSED OFF UNLESS YOU CONFIRM RESERVATION FOR 3 OR MORE AND PAY THE EXTRA. IF BOOKING FOR 3 OR MORE, 2ND BEDROOM WILL BE OPENED UP. FEE PARKING AVAILABLE ON PROPERTY. 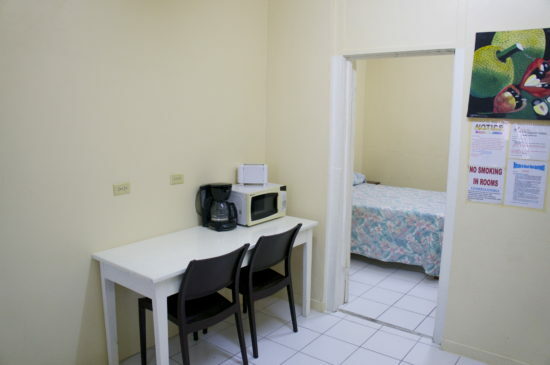 Room 4 is a spacious 338 sq foot room. The bathroom was completely upgraded at the beginning of 2016. It comes with a microwave, coffee maker and small fridge. A hot plate is available upon request. 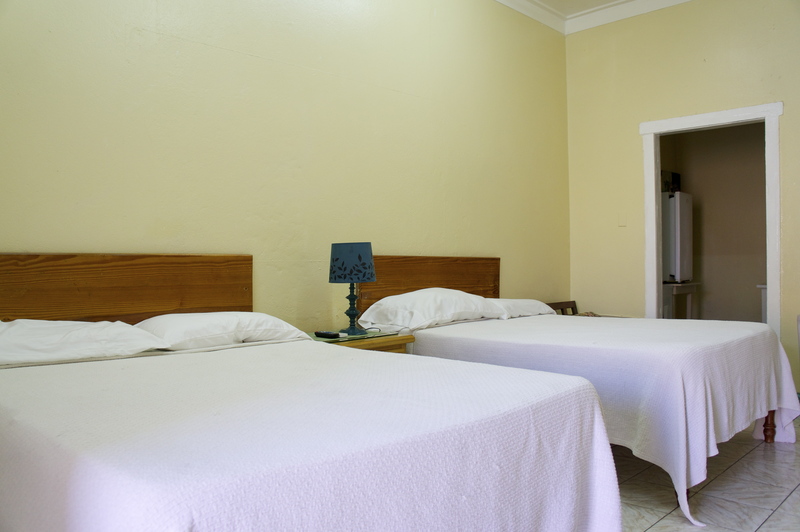 Room 5 is a spacious 500 sq foot room with high ceilings. 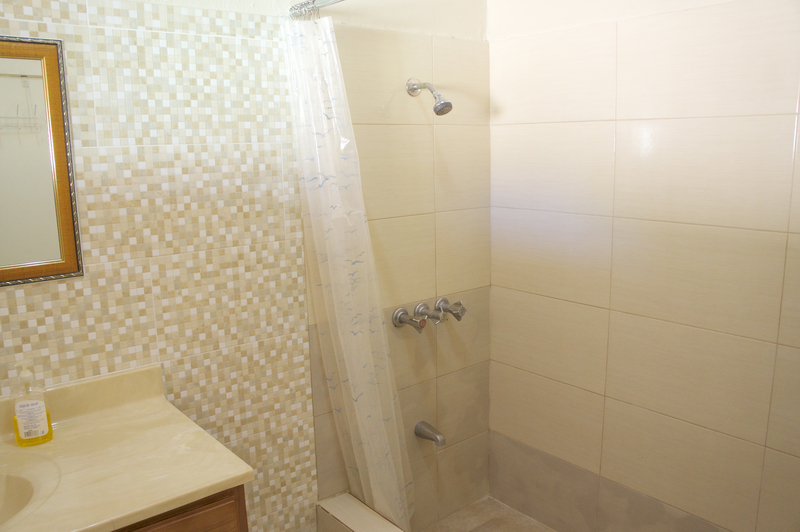 It has a separate bedroom for additional privacy from the living room area. It also comes with a microwave, coffee maker and small fridge. A hot plate is available upon request. Our onsite manager Pauline is available to help you with local restaurant recommendations, trip planning, tour tips and more.We are located in the heart of the tourist strip so a car is not necessary for short stays. However, we do offer free parking if you have a car. There are plenty taxi’s at the airport and they normally will accept $15 USD for transportation to The Irie Inn. If you decide to travel to other cities, I would recommend the Knutsford Express bus. They provide inexpensive transport across the island with Wi-Fi. 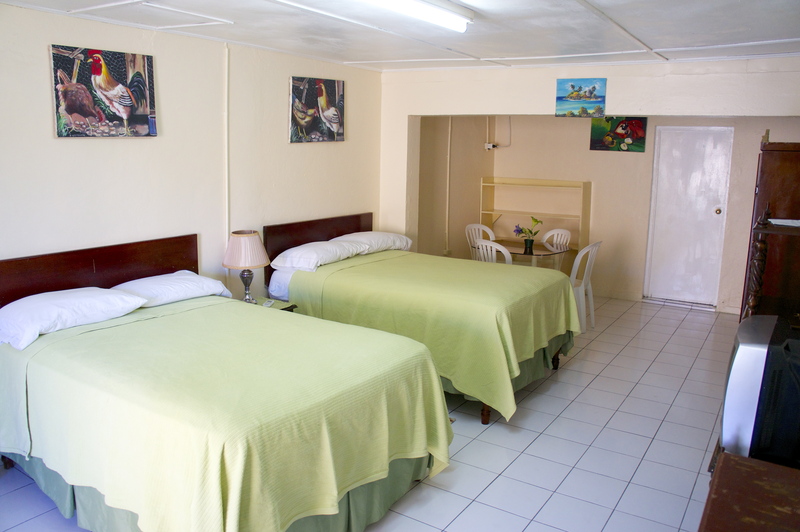 Please treat The Irie Inn as your home while in Jamaica. No smoking cigarettes inside rooms please. Once availability is confirmed, please book below. Note: You may change the number of nights AFTER you hit the Paypal button in the quantity field.